So your child has been diagnosed….now what? Life as a parent of a special needs child is not easy. Parenting typical kids is hard, imagine parenting a special needs child in a society driven by normalcy, achievement and academic success. It’s a long, arduous road, one I never thought I would take, but one that has brought so many rewards and blessings along the way I would not have it any other way. My special needs daughter is now eleven years old. If you asked me a hypothetical question like, “If you can miraculously cure your child, would you?” the answer is, of course I would. If my daughter no longer needed daily medication for her petit mal seizures, if she can learn in a general education class with all her peers, if she can talk in complex sentences, if she can help me around the house with chores like other 11-year olds, if she can read books at her age level, if she can memorize the multiplication table, if she can participate in team sports like her friends, if she can socialize with other “typical” girls during recess, of course I would. What parent would not want what is normal, accepted and promising for her child? But if you asked me “If you can have a typically functioning child instead of E, would you agree?” my answer would be no– because that child won’t be my daughter. E is so special and so sweet in her own way that I can’t imagine her being like everyone else. It’s almost like, if she suddenly began to operate like other girls her age, she would no longer be her but someone else. And I don’t want anyone else but her. I hope this makes sense, and I really hope others can understand that parenting a special needs child is not just a burden or struggle, but also a huge source of blessing and reward. It doesn’t come for free though, and the inner peace and acceptance can only come after years of heartache and discouragement. It’s a nonstop struggle, and I deal with these emotions until this day. My daughter’s exact diagnosis is SYNGAP 1. It’s a genetic disorder that causes seizures, learning disability, low muscle tone, sensory and processing issues among many others. It’s a lifelong condition that’ll affect her for the rest of her life. Because this disorder hasn’t been discovered since the early 2000’s, it took us nearly 5 years to figure out the exact cause of her delays. I know moms of younger, newly diagnosed children may feel lost, helpless, and discouraged. You know you have a long, arduous road ahead of you, you just don’t know HOW you will make it through in one piece. You cry silently, pray sometimes with hope and sometimes with sadness, and feel like you’ve hit a brick wall and there’s no way out. If you’re feeling this way today, I want you to know that it’s okay—- and grieving is a very important and much-needed process. I also want to remind you of the following things that helped me over the course of my journey. This is so important. Don’t live in denial, don’t try too hard to be “hopeful” or “idealistic” because raising a special needs child is the wrong time to be blindly optimistic. Don’t take the “let’s wait and see” approach because early screening and intervention is KEY. Some kids may “grow out of it,” other kids may continue to exhibit delays and problems. But it doesn’t matter. Start early because it will help. I began early intervention when my daughter was just over one year old and she’s still in various therapies. She never miraculously grew out of it and it’s been a long and slow journey, but knowing I did everything I can for her puts me at ease and peace with what’s going on. If I had spent those early years waiting around for some miracle or being blindly hopeful, I don’t think I would feel the same amount of acceptance today. Allow yourself time to accept and grieve your reality. It’s undoubtedly difficult for any parent to accept the fact that her child may never be like other kids. To think that your child may learn, talk, function and live differently than others will always be a difficult pill to swallow. But it does get easier and it will get better. Trust me. Humans are resilient beings- both you and your child. Everyone will come out of it okay, even better and stronger than before. Until then though, allow yourself to grieve. Cry, talk to friends if you need their support, talk to your parents, go to therapy, do whatever you can to release yourself from the burden, the guilt and the weight of it all. Don’t keep it bottled up inside because this will create lasting problems for you and your child. Now is the time to be brave and be the strong mama bear you are. There is no time or room to feel shame, repress, run away or retreat to your safe corner. The universe is giving you a chance to grow into a better, stronger and more loving human being. Embrace it. Be proactive and courageous. You can do this. 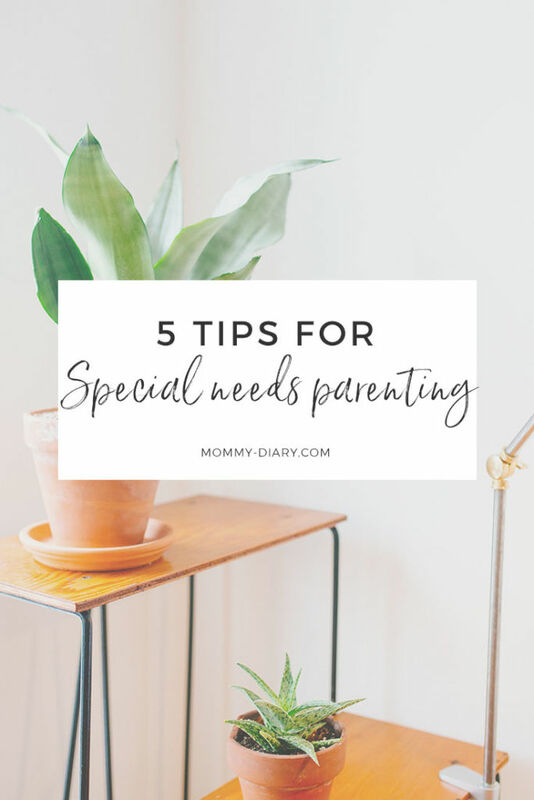 Being the parent of a special needs child requires tons of meetings with specialists, doctors, therapists, supervisors, administrators, teachers, social workers, etc. In the beginning, I made the mistake of thinking the worst of everyone and I went into my first IEP meeting (when my daughter was 3) ready for war. How clueless I was. Yes the school district and insurance will be difficult at times to deal with but it’s part of their job. Don’t take it personally and don’t let emotions get the best of you. Most of them do genuinely wish to help, they just have to be the gatekeeper of an institution (because it’s their job) or offer you a pre-existing solution that they offer to every parent like yourself. With that said, be willing to listen and understand but know you don’t have to agree. Don’t be afraid to demand what your child needs and let them know you’re willing to file a grievance if things don’t work out. You can do this in a calm, respectful manner. Whether you’re dealing with the school district or the insurance company, there’s always the next step to take if you don’t agree with their decision. Read through the notice of procedural safeguards. Familiarize yourself with IDEA (Individuals With Disabilities Educational Act), which is a law ensuring services to children with disabilities throughout the nation. Contact California Department of Managed Healthcare regarding complaints about health insurance. Read through Wrightslaw Special Education Law and IEP FAQ’s. Look for local support groups of special needs parents. You can find one easily by contacting your local regional center. Contact your local regional center. They will help you get started with testing, services, advocacy, etc. And of course, learn as much as you can about your child’s diagnosis. Remember, a diagnosis is a diagnosis and nothing more. This can always change and it does not define your child. You as a parent, know best. Get second opinions if you’re unsure about a diagnosis. The first diagnosis my child received was hypotonia (low muscle tone), then apraxia of speech and a loose term of global developmental delay. It wasn’t until many years later when we finally found the genetic change that causes these problems in my daughter. It took us nearly five years since the beginning of testing (around age 8 or 9) for an accurate diagnosis yet we didn’t wait around to get her services. For example, I knew E would benefit from ABA but because she didn’t have the “autism” diagnosis, it was more difficult for her to get as many hours. So I conducted my own research, took paper copies of studies that show children with general developmental and intellectual disability can also benefit from ABA services and demanded that the school/regional center provides it. And they agreed. I found that with enough knowledge and preparation, institutions are usually willing to work with you. As a parent of a disabled child, you hold many rights, power and recourse. Don’t forget that. Because you will need it. Raising a special needs child means you are constantly thrown in situations where you feel like you might just lose it. Yes raising any child can make you feel like this, but when that child has special needs with different ways of processing information, it can add another layer to the complexity of parenting. You may get weird stares from other people who don’t understand why your 10-year is throwing a tantrum like a 3-year old in middle of the grocery aisle, or why you’re simply ignoring the behavior instead of disciplining like other parents (Behavior extinction: an important concept of ABA). Other parents, even your own friends, may not understand why you’re not putting them in time-out or “talking through it” like you would with a typical child. They may make comments or silently judge you. You will feel misunderstood, judged and isolated. You may lose it— and you will feel intense stress in car rides or at home due to a behavior that you just can’t handle. Learn how to deal with these high stress moments. Learn how to take a deep breath, walk away, and sometimes cry through it in your bedroom. Go to therapy even if it costs money. Your mental and emotional well-being is most important at this time. Seek spiritual counseling. Ask for help and support. You are given this role because you can handle it. Even if you’re not a religious or spiritual person, now is a great time to begin a spiritual journey because you will need it. Even if you’re not a religious or spiritual person, now is a great time to begin a spiritual journey because you will need it. As you navigate through life, you will run into situations that logic, science, and reason just can’t explain. This is it. Seek a higher power, whatever that may be. I’ve written at length about ten things I learned from my special needs child and why God gave me a special needs child among other short reflections about raising a special needs child. You can find them under the category “special needs” in this blog. Great tips. Thanks for that. It’s hard parenting a special needs child most definitely. I’m glad you find them useful! Such a long but rewarding journey isn’t it? Oh Angela, you hit the nail on the head soooo many times in this article! I agree with you on everything! And thank you for writing so effortlessly about such a HARD but REWARDING lifestyle. New moms will definitely benefit from reading this!